Fits M12-1.0 mm tailstock. Screw-on version with two bearings. Long nose version, same as up at eBay. Steel. Fits UNIMAT SL DB tailstock. Pin version. 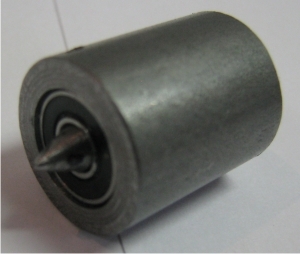 Two bearings, steel. The PIN version is in our opinion better than the screw-on type live center. It is less bulky, only 0.5 diameter, reaches over the cross-slide, and has two bearings. 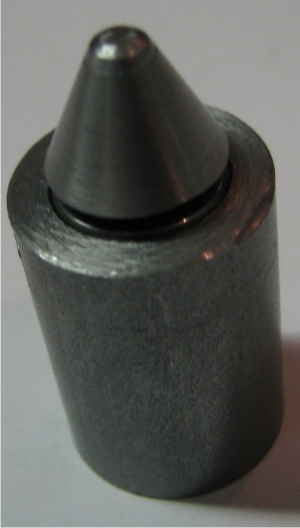 Similar to a dead center, the pin end will remain stationary in the tailstock quill. The same pieces can be made for UNIMT 3.
International shipping: we reimburse over paid shipping costs on international orders.